In the typical dilution case, the owner of a famous mark will only be able to obtain injunctive relief (e.g., a court order prohibiting the competitor from using the mark). However, under certain circumstances, the FDTA grants the owner more significant remedies. For example, if the person against whom the injunction is sought “willfully intended to trade on the owner’s reputation or to cause dilution of the famous mark,” the owner may be entitled to recover enhanced remedies, such as defendant’s profits; damages and costs; attorney fees; and the destruction of infringing articles. Trademarks are important tools used to protect both consumers and sellers of goods or services. Trademarks identify the origin or source of a good or service, allowing consumers to make informed decisions regarding quality. Trademarks... Read more. Ownership of a copyright gives the owner exclusive rights in the copyrighted work, such as the rights to reproduce, distribute, perform and display the work. According to Section 201 of the federal Copyright Act (the Act), copyright... Read more. In order to comply with the copyright laws of the United States, most establishments that play copyrighted music are required to secure permission before doing so. A commercial or private entity (or individual) may do this by obtaining... Read more. Generally, a “trademark” is a distinct word, phrase, symbol, device or combination thereof, affixed to goods or services, that serve to identify the source, or manufacturer, of the good or service. Trademarks function to: 1)... Read more. 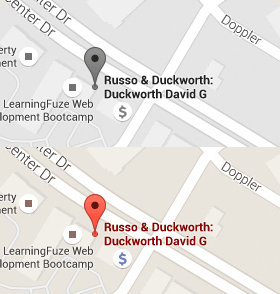 The attorneys at Russo & Duckworth represent clients throughout the United States, but in particular in California and the Orange County cities of Aliso Viejo, Anaheim, Brea, Buena Park, Costa Mesa, Cypress, Dana Point, Fountain Valley, Fullerton, Garden Grove, Huntington Beach, Irvine, La Habra, La Palma, Laguna Beach, Laguna Hills, Laguna Niguel, Laguna Woods, Lake Forest, Los Alamitos, Mission Viejo, Newport Beach, Orange, Placentia, Rancho Santa Margarita, San Clemente, San Juan Capistrano, Santa Ana, Seal Beach, Stanton, Tustin, Villa Park, Westminster, and Yorba Linda. © 2008 - 2019 Russo & Duckworth LLP. All rights reserved.